It’s what the Suffolk County Legislature is noted for — passing first-in-the-nation laws. And the panel has done it again, passing a measure that bans receipts coated with the chemical BPA, the acronym for Bisphenol-A, which has been found to be a cause of cancer and other health maladies. “Once again this institution is going to set the standard for other states to follow,” declared Legislator Steve Stern of Huntington after the passage of his bill December 4. And County Executive Steve Bellone intends to sign it into law. BPA has become common, used widely to harden plastics and as a coating inside cans of beverages and food. 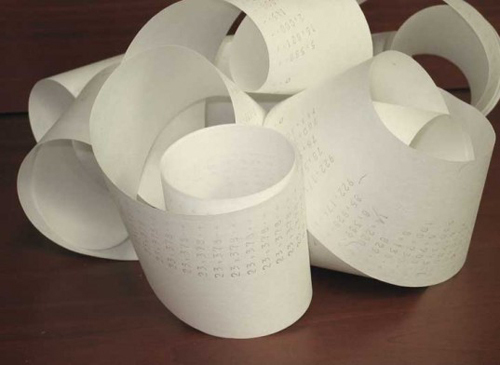 Another use is coating the paper used for receipts enabling it to become “thermal paper” and react to heat to print numbers and words. In 2009, the Suffolk Legislature enacted a first-in-the-nation law — also authored by Stern — prohibiting the use of BPA in baby bottles and other beverage containers used by children under three. Mr. Stern was made aware of the health dangers of BPA by Karen Joy Miller, founder of Prevention is the Cure, an initiative of the Huntington Breast Cancer Action Coalition. Prevention is the Cure emphasizes the elimination of the causes of cancer. Meanwhile, claiming that BPA is safe was Stephen Rosario of the American Chemistry Council. Millions of tons of BPA are now manufactured annually and the American Chemistry Council has led the charge in defending the substance. The bill refers to Stern’s earlier “Toxin Free Toddlers and Babies Act.” He noted that since the passage of “this groundbreaking ban,” a national counterpart of the measure was enacted — “finally, this summer” — by the U.S. Food and Drug Administration. And, critically, as the legislation notes, there are several manufacturers that produce thermal paper that does not contain BPA. That’s the way it is for toxic products and processes: there are safe alternatives for them. There are safe substitutes for virtually every deadly product and process. The problem? Vested interests that continue to push and defend them. The Stern law carries penalties of $500 for the first violation and $1,000 “for each subsequent violation.” It hopefully will be replicated far and wide.